Everybody's doing it on TV! Fashion forward starlets and divas are wearing lightweight little sweaters over their chic sleeveless dresses or camisoles. Find your own star on the Hollywood Walk of Fame by making this version of a classic, using a light, easy care, worsted weight yarn. This three-quarter length sleeved, notch-necked cardigan is enhanced by horizontal eyelet styling and single decorative button closure. Whether you're out clubbing or just under the office AC, you'll look cover-girl ready! 1 - 1 inch/2.54cm button - have FUN with this! CO 145 [165, 181, 189] stitches using #5 / 3.75mm needles. Do not join, but work back and forth. Work 3 rows 1x1 Rib. (1x1 Rib: *K1, P1, repeat from * across). (WS): Switch to #8 / 5mm needles and P across. You will now work in Stockinette Stitch for the remainder of the body. Next Row (RS): Work 36 [41, 45, 47] stitches, place marker, work 73 [83, 91, 95] sts, place marker, finish row. Work 11 more rows, ending with a WS row. INC Row (RS): K within 1 st of marker, M1, K1, slip marker, K1, M1, K 71 [81, 89, 93], M1, K1, slip marker, K1, M1, finish row. Repeat INC Row every 12th row 4 [4, 4, 4] more times. Continue working in Stockinette St until piece measures 13 [13.5, 14, 14.5] inches ending with a WS row. Next Row (RS): *Knit within 6 [6, 7, 7] sts before marker, cast-off next 12 [12, 14, 14] sts. Repeat from * one more time. Put aside and make 2 sleeves. Cast-on 38 [42, 46, 50] sts using #5 / 3.75mm double-point needles. Place marker and join, being careful not to twist stitches. Work 3 rounds in 1x1 Rib. Change to #8 / 5mm double-point needles. Knit 4 [4, 5, 2] rounds. INC Round: K 4 sts, M1, K1, place marker, K1, M1, finish round, removing the marker that is at the end of the round. Repeat INC Round every 5th row 5 [2, 0, 0] more times, slipping marker when you come to it. INC every 6th round 7 [10, 12, 12] times. Continue working for 5 [5, 6, 6] rounds. Place 52 [56, 58, 62] sleeve stitches on holder. With WS facing you, Purl the 35 [40, 44, 46] sts of the Left Front, Place Marker (PM), purl the 52 [56, 58, 62] first sleeve stitches from holder, PM, purl 71 [81, 87, 91] Back sts, PM, purl the 52 [56, 58, 62] second sleeve stitches from holder, PM, purl the 35 [40, 44, 46] sts of the Right Front. Next row (RS): *Knit to within 3 stitches of the Marker, K2TOG, K2, SSK, repeat from * 3 more times. Repeat DEC row every RS row 8 [9, 10, 11] times. Knit next 3 rows, starting with the next row (WS). Work DECs in the established way on the middle RS row. Next row (RS): K2, *YO, K2TOG, repeat from * across. Do not work DECs on this row. Knit next 3 rows, starting with the next row (WS). Work DEC in the set manner on the middle RS row. Continue working in Stockinette St, working the established DECs on every RS rows. After 7 [8, 9, 10] DECs have been worked from the garter/eyelet/garter rows, begin Neck Shaping. 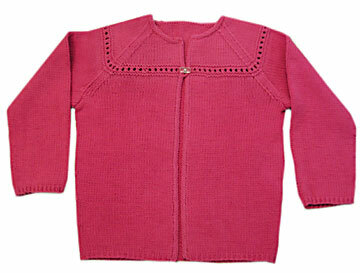 During the Neck Edge Shaping, you will continue working the raglan shaping until the sweater is finished. Bind-off 4 [5, 6, 7] stitches at the beginning of the next two rows. Bind-off 2 [2, 3, 3] stitches at the beginning of the next two rows. Dec one stitch at the beginning and end of each row until 1 stitch remains before the markers on the left and right fronts. Using #5 / 3.75mm needles and right side facing you, pick up 95 [101, 107, 113] stitches along front edge with RS facing you. Row 2 (RS): P across. Row 3 (WS): Bind-off all stitches knitwise. Using #5 / 3.75mm needles and right side facing you, pick up a stitch for each stitch facing you along neck edge. Sew underarm seam. Use tails of yarn to reinforce large stitches. Lightly press with warm setting. Pay special attention to the front band, which can be carefully steamed more heavily to make it flat and prevent rolling. Be sure to NOT heavily steam the body of the garment, concentrating on the front band only. 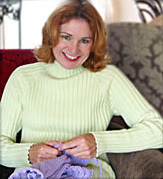 Using the size F crochet hook, attach yarn at the lower garter ridge of decorative eyelet area on the right front. Chain enough stitches to go around the button you have chosen to use. Attach the chain to the upper garter ridge of eyelet area to form loop. Bonne Marie Burns, founder of the hugely popular and highly entertaining ChicKnits.com, believes in never letting her beer budget get in the way of her chic champagne tastes! Currently, she is obsessed with socks. Pattern & images © 2003 Bonne Marie Burns.